1 of 7 Heat oven to 325 degrees. Line a 9 x 9 x 2-inch baking pan with foil. 2 of 7 Whisk flour, cocoa, baking soda and salt. Combine butter and chocolate in a large glass bowl. Microwave in three 30-second increments, stirring until smooth. 3 of 7 Whisk in sugar and flour mixture, then eggs and vanilla. Spread into prepared pan. 4 of 7 Bake at 325 degrees for 35 minutes or until pick inserted in center comes out clean. Cool in pan for 10 minutes; use foil to lift from pan to a wire rack. Cool completely. 5 of 7 With a serrated knife, slice in half horizontally. Line pan with plastic wrap and insert top layer, cut side up, in pan. 6 of 7 In a medium bowl, beat cream cheese and caramel sauce. Sprinkle gelatin over 2 tbsp water in a small glass bowl and let stand 5 minutes. Microwave 15 to 20 seconds until dissolved. Beat into cream cheese mixture. Whip 1 cup of the heavy cream to stiff peaks. Fold into cream cheese mixture. Spread onto brownie layer in pan and top with remaining layer, cut side down. Refrigerate 2 hours. 7 of 7 Whisk remaining 1/2 cup cream to stiff peaks. Use plastic to lift stacked brownie from pan. With serrated knife, cut into squares. 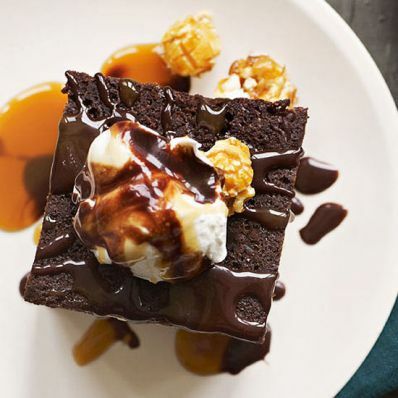 Top each square with a dollop of whipped cream, some of the caramel sauce, chocolate sauce and caramel popcorn. Serve immediately. Per Serving: 400 kcal cal., 13 g sat. fat, 46 g carb., 23 g Fat, total, 101 mg chol., 211 mg sodium, 0 null Mark as Free Exchange, 1 g fiber, 5 g pro.